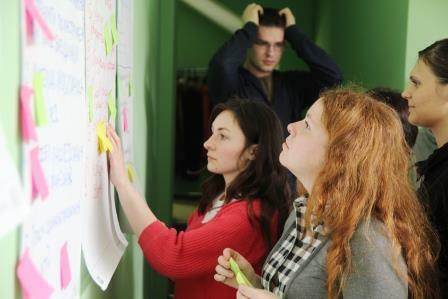 Journalists from Azerbaijan, Armenia, Belarus, Georgia, Moldova, Russia and Ukraine acquire smart skills about video, photography and data visualisation, doing online research, and internet security. This blended learning course consists of a strong attendance phase in Germany and one intensive e-learning module. Journalism means collecting, evaluating and publishing information, and this definition also applies in the digital world. Each technical advance opens up new possibilities for research and publishing. To take advantage of these opportunities, journalists must constantly build and update their skills. And they have to cope with a dangerous risk – the lack of digital security. Journalists will have to adapt to this – and repeatedly because of ever shorter innovation cycles. Against this background, the Interlink Academy for International Dialog and Journalism is offering the ‘Digital Journalism for Eastern Europe’ blended-learning training program. Participating journalists from Eastern Europe are given an opportunity to update their technical skills and discuss current media ethics issues. Networking and sharing the newly gained knowledge with their colleagues back home will also play an important role in the program. “Digital Journalism for Eastern Europe” is a blended-learning program. It consists of two stages: one strong attendance phases at the start in Germany and one e-learning phase. During their study stay in Hamburg, the participants acquire new journalistic skills in intensive sessions of lectures, practical group work, discussions and visits to innovative working newsrooms, all supported by the teaching staff. This will be complemented by webinars with international speakers and internet experts. This attendance phase is followed by an e-learning phase during which the Fellows put into practice what they learnt at the Interlink Academy and work on journalistic assignments as well as participate in so-called webinars (virtual lectures) in their familiar working and living environments at home. The e-learning phase requires an average time commitment of 5 hours a week. After the end of the course, the Interlink Academy remains in close contact with the participants through its Alumni and mentoring services. Courses at the Interlink Academy are run by highly specialized lecturers and trainers from Germany and abroad who have considerable experience with international study groups. Great attention is paid to the journalistic expertise of lecturers as well as their experience as educators. The program is sponsored by the Government of the Federal Republic of Germany. Other partners are: Netzwerk Recherche Germany, the Independent Journalism Center in Moldova, the Georgia Association of Regional Broadcasters, the Azerbaijan Journalist’s Network, the Investigative Journalists Network in Armenia, the Bumaga Media Group/Paperpaper in Saint-Petersburg and the Union of Young Independent Journalists in Ukraine. Participants receive a scholarship grant to cover course fees and international travel costs. During the attendance phases, the participants are housed in guesthouses or hotels at the expense of the Interlink Academy, and receive an adequate meals allowance. The “Digital Journalism for Eastern Europe” program is aimed at professional journalists from Azerbaijan, Armenia, Belarus, Georgia, Moldova, Russia and Ukraine. Applicants must have a good command of English (reading, written, spoken), as the whole program is conducted in English. The Interlink Academy expects salaried editorial staff to be released for the duration of the attendance phases while continuing to be paid by their employer, and to receive appropriate support from them during the e-learning phase. Freelance journalists should ensure that during their stay in Germany they are able to pay their ongoing costs in their home country. The attendance phase in Germany may require participants to compromise on their traditional diet and daily routine. And please note that the program can also involve physical challenges, such as carrying heavy equipment over long distances. Applications will be accepted from March 24 to April 5, 2016. They must be submitted online using the electronic application form on the Interlink Academy website. Please draft the required motivation letter with care. Incomplete applications will not be considered. Find the website of the project here.